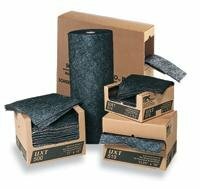 SPC 107850/UXT15P 3-ply construction; double-sided, low-linting coverstock and meltblown core; heavy weight perfed pads. Perfed every 18" to help you use only what you need and reduce waste. Spunbond coverstock on both sides offers are maximum durability and very low linting, both abrasion resistant and non-abrasive performance - perfect for wipe down applications, the extra strength required for the wringing and re-using of sorbents. Perforated to help you use only what you need - reduces waste. Premium sorbent pads and rolls for your toughest applications. High performance sorbents made to handle virtually any liquid. Size is 15" width, 150' length. Universal class. Applications are overspray leaks and drips, workstations, heavy clean up and wipe up drums - liquid storage, outfalls and discharge ponds. Configuration is roll. Three ply spunbond coverstock technology. 17 gal/bale absorbency. Shipping weight is 14.5 lbs.